While on a carpool run a few months ago I developed a loose theory that there are more bike riders with white beards than riders with any other physical feature noticeable when zooming by in a car. So I began trying to capture as many white beards as I could while driving and walking around the Greater Boston area. I will be posting the on-going results of my white beards research and welcome reports and data points from all corners of the globe. 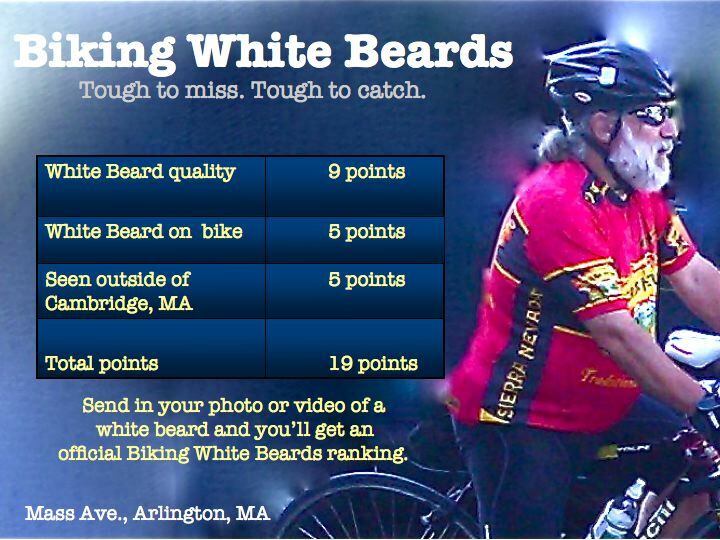 And be sure to send in a photo or video of a white beard and you’ll receive a free and official Biking White Beards ranking. So far my studies have taught me a few things: 1. my kids and their friends think I am nuts 2. filming bike riders while driving is more dangerous than texting (I have since stopped Documenting While Driving) 3. white beards are tough to catch and 4. I find myself paying a bit more attention to bike riders.